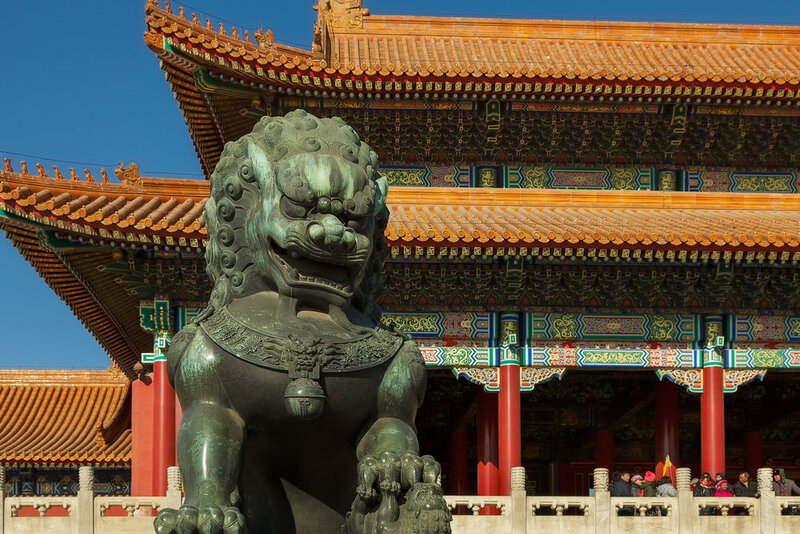 A close up exploration of an amazing building at the Temple Of Heaven complex in Beijing, China. It's the richly decorative colors, shapes and textures that drew my attention. It’s frustrating when your own photography is compromised by folks walking right in front of you to make their own photo or organizing their loved ones right smack in the middle of that composition you’ve taken time to construct. What happened to etiquette in photography? Standing there with a tripod mounted camera and cable release only seems to make things worse. There have been numerous times when I’ve stood, somewhat dumbfounded, as each and every member of a family poses for photos while I wait patiently to make my own. Folks have even set up a picnic in front of the scene I was about to photograph. I kid you not. 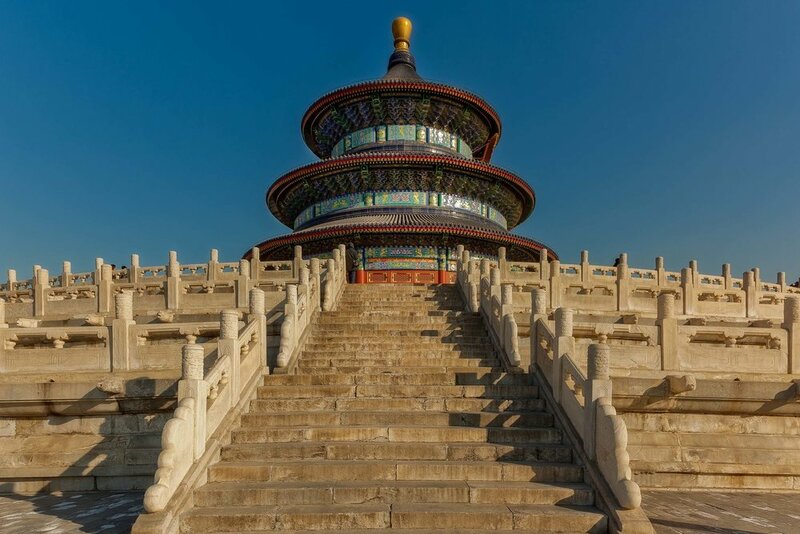 A view up a flight of stairs to a beautiful architectural structure in the grounds of the Temple Of Heaven in Beijing, China. I love the Temple of Heaven in Beijing. It’s a very large complex with many architecturally interesting buildings to photograph. I consider it to be a much more interesting location for the enthusiastic photographer than the Forbidden City, though for variety it’s wise to spend time (probably half a day) at each location. I visited the Temple of Heaven in the middle of a cold Beijing winter, though that didn’t seem to stop anyone else. The place was packed with local tourists. I can only imagine how crowded it must get when visiting in the middle of summer. A large panel of Chinese writing on display at the Temple Of Heaven in Beijing, China. One of the things I’ve learned over the years is that, with a relatively large and expensive camera kit, you become a magnet for local photographers wanting to make their own photos. This has happened to me in numerous countries, including my own, so it’s not simply a cultural thing. By it can be a real pain just the same. I guess folks conclude I know what I’m doing and their competitive nature causes them to push in on the action. I have no problems with sharing a location or, through my actions, suggesting a potential photo opportunity, but you’d think they’d wait (often only a few moments) until after I’ve made my photo. In certain highly populated countries life can be tough in the extreme and I often wonder if the lack of personal space that exists in larger cities means that my sense of good manners is simply not relevant. As is so often the case it’s good to be culturally sensitive, but you have to balance that with your need to make your photos. Sometimes you just have to sit it out until the people in question have move on. Other times you’ll need a more assertive approach. Perhaps a simple, but firm explanation of what you’re doing and a request that they hold on a minute before moving in front of your camera is all that’s required. Other times I simply walk away, wait for the crowd to dissipate and then move back to make my photo. 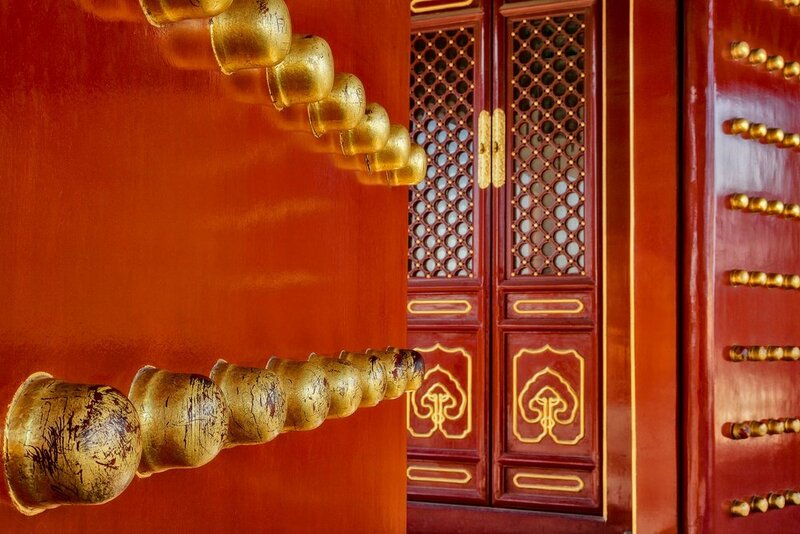 My wanderings around the Temple of Heaven brought me to a beautiful door. True to form, no sooner had I brought my DSLR out than the hordes descended, standing in front of me to make photo after photo. After waiting for about 10 minutes I decided to move away and look for other things to photograph. Fortunately, I was able to return to make a photo, very quickly, before a new crowd of local tourists pushed in on the action. A beautiful, highly textured sign featuring vividly colored characters against a red wall in the grounds of the spectacular Temple of Heaven in Beijing, China. I noticed this lovely sign and moved in close to photograph it. I love the luminous quality of the wood in this highly textured sign. Likewise, notice how the warm/cool color contrast between the Chinese characters and the wall make for a dramatic composition. One advantage of moving close, as opposed to simply zooming in, is that you make it hard for folks to walk in front of you. If they want to make their own photo they’ll have to do so from behind you or, and here’s a radical concept, wait until you’re finished. I find this technique works a treat. What’s more, by moving in close you often have to resort to a wider angle focal length which tends to exaggerate line and shape, particularly when photographed side on to your subject. This approach will often result in more visually dynamic images. Try it! Next time you find yourself battling the crowds to make a photo try this simple trick. Move in close and employ a wide-angle lens. It’s such a simple technique that will allow you to make your photos more quickly and without too much fuss. It may also make the whole experience of photographing the location much more enjoyable.